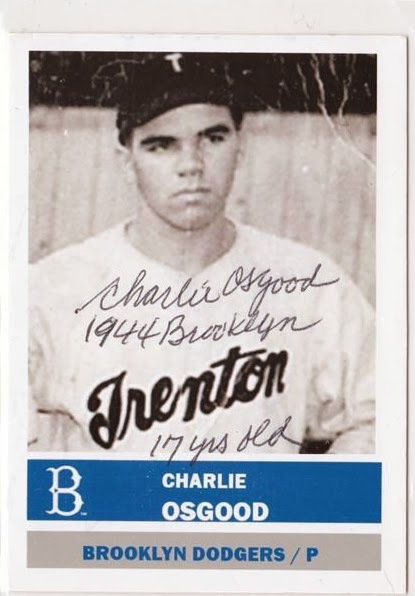 Charlie Osgood, a pitcher of one game for the Brooklyn Dodgers in 1944, died January 23, 2014, in Tewksbury, Massachusetts. He was 87. In the summer of 1944, with the Brooklyn Dodgers roster depleted by players leaving for their World War II service, Branch Rickey reached into the depths of his available talent pool to pluck seven different players aged 18 or younger to fill the void left by his departed veterans. For one of his recruits, Rickey didn't have to look any farther than the Dodgers' family. Clyde Sukeforth, the Dodgers scout who later gained notoriety for his instrumental role in scouting and signing Jackie Robinson, had a nephew in Osgood who was a prized high school pitching star in Massachusetts. Desperate to stem their pitching woes, Rickey signed Osgood directly to the major league club. Osgood made his major league debut on June 18, 1944, against the Philadelphia Blue Jays (nee Phillies) at the tender age of 17. Pitching in relief of his elder statesmen of McLish and Branca, he had difficulty with his control, walking three batters and hitting another. Despite his wildness, he managed to escape with allowing only one run in three innings of work. It would be his only appearance in the major leagues. A few weeks after his debut, Burr reported in the July 6, 1944 edition of The Sporting News, that the Dodgers had sent Osgood to Class B Newport News for more seasoning. He finished the season shuttling between their farm clubs in Trenton and Montreal, playing a few games at each stop. At the end of the year, he was left unprotected by the Dodgers in the minor league draft and signed by the Chicago Cubs. Osgood’s career was interrupted in 1945 to serve in the United States Coast Guard during World War II. He returned to the Cubs organization in 1946, and after two pedestrian seasons in the low minors, Osgood was out of professional baseball. In his post-playing days, he graduated from Suffolk University and went on to work as a credit manager at the Boston Globe before retiring in 1988. For most of his retirement, Osgood remained elusive to fans and collectors, ignoring requests for interviews and signatures. Only in the last few years of his life, did he entertain some of the mail that was sent his way, including the homemade baseball card below.